As the days once again get shorter, and the stores once again fill up with Halloween costumes, economic pundits turn once again to that most tempting of seasonal sugarplums: holiday hiring. Every year between September and November, the unemployment ranks shrink as hundreds of thousands of workers find short-term jobs staffing department stores and UPS offices, gift shops and Santa booths. Most years, seasonal employment is a boon for college students and underemployed spouses, but this year, for thousands who have spent months looking for work, it's beginning to look like short-term salvation. The million-dollar question is how many jobs will become available in the next few months. Figures from the Bureau of Labor Statistics show that 2007 hires jumped by more than a million between September and their high point in November -- but last year, hires dropped by 237,000 during that period. While we're unlikely to hit the massive numbers of 2007, retailers hope they can make a significant leap over last year. 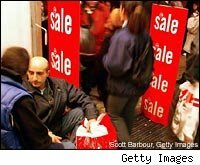 The retail sales numbers for the last few months support a mildly optimistic outlook. The U.S. Census Bureau reports an average of 3.9 percent growth each month between February and August, with an overall growth of 19 percent over the same period. August's sales dropped by almost 6 percent over the past year, but these are still promising numbers, suggesting that this holiday may yet be reasonably merry. This is especially true for technology stores. Best Buy has already announced plans to increase its seasonal hiring over last year, as has HH Gregg. At a recent press conference, Best Buy CEO Brian Dunn said that customers are once again buying goods but expect greater value for their money. Not everyone is quite so optimistic. Most industry consultants suggest that holiday hiring will either be flat from the 2008 numbers or will rise only slightly. Deloitte research predicts that seasonal sales will remain flat; the International Council of Shopping Centers, as Daily Finance's Mercedes Cardona recently reported, forecasts modest 1 to 2 percent growth over last year. This has translated into a highly competitive seasonal job market. While 62 percent of retailers plan to hire seasonal employees, according to the Hay Group, 57 percent plan to reduce holiday staffing from last year's levels. Of course, as any good Keynsian would argue, every employee that a mall store hires translates into increased revenue for the mall. How much could holiday hirings affect the holiday-season bottom line? Could "the most wonderful time of the year" translate into the most wonderful stimulus of all?